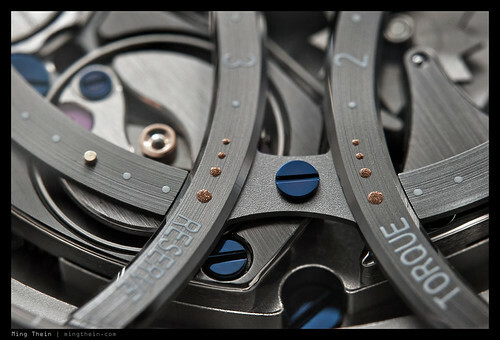 It seems that this year is to be the year of the super complication! 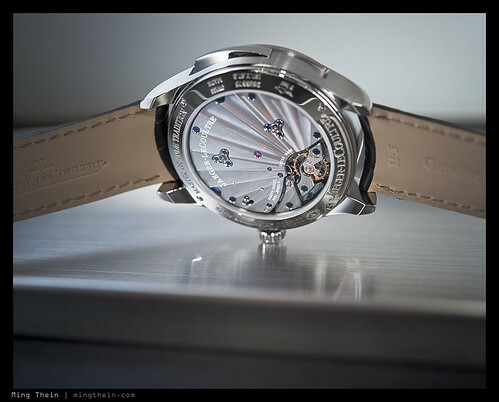 Thanks again to the folks at Jaeger-LeCoultre, we had the opportunity to photograph and enjoy this piece for a very short period of time – enough to produce some images and gather some impressions of this rare bird. As usual, click on any image for a larger version. 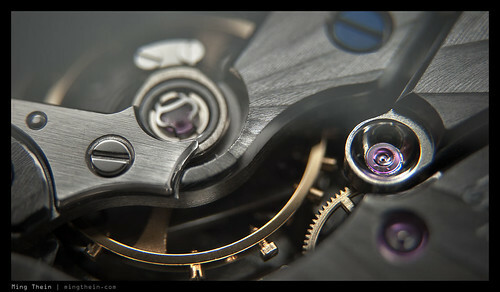 Most repeaters are housed in cases of ‘heavy’ metals – think platinum, or at very least, gold; there have been a few forays into exotic metals (I have no idea what Richard Mille would use if they were to ever make a repeater) but titanium seems to be the predominant choice for non-precious metal cases. The reason for this is fairly simple: it sounds different. Although case design plays a huge part in the final sound of the piece, given all other things being constant, a denser case will probably sound richer than a less dense one; however it will also be softer because more energy is required to make the case resonate. 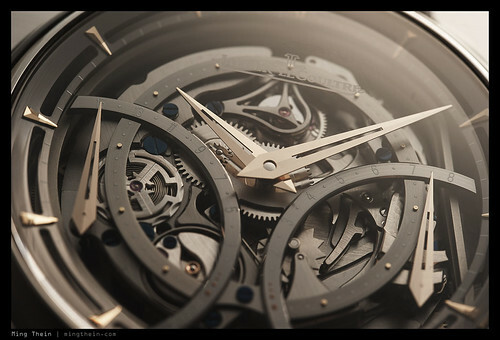 I can’t claim to have handled a huge number of repeaters; however this does seem to bear out with the Master Minute Repeater (MMR) – the gold versions are not as loud as the titanium, but they do sound a bit richer. The titanium cased version is a little crisper, and has a slightly sharper pitch. 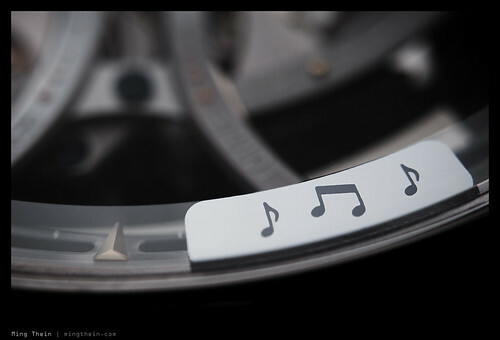 All variants are fairly loud by repeater standards, thanks to the coupling of the gongs to the sapphire crystal – which effectively acts as a resonator. The regulator is also noticeably silent, adding almost zero background noise to the proceedings. Two enormous barrels give this watch a power reserve of two weeks; it’s probably not the kind of piece you’d wear every day, so being able to set and leave it for an extended period of time between wearings makes sense. Thanks to shorter gearing, it doesn’t take that long to wind fully either. Note the tri-lobed chatons holding the arbors for the two enormous barrels. 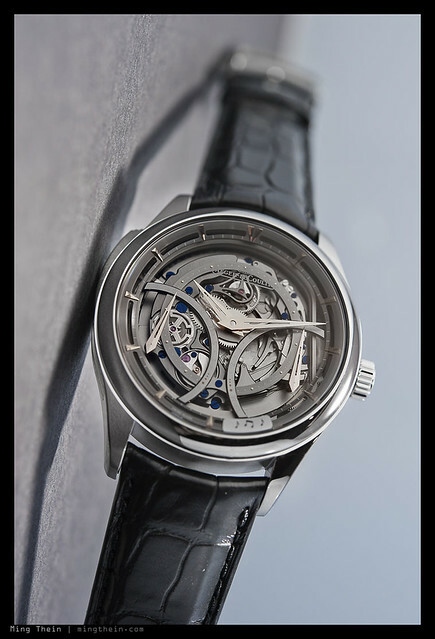 One of the consequences of having such a long power reserve – despite a large movement diameter – is that the barrels take up a huge amount of space; this leaves little room for the balance wheel. Although larger balances carry more inertia and are generally more rate-stable, a smaller balance also uses less power to oscillate and permits an even longer power reserve. (Inertia varies with the square of the balance radius; energy requirements are linearly related to inertia). 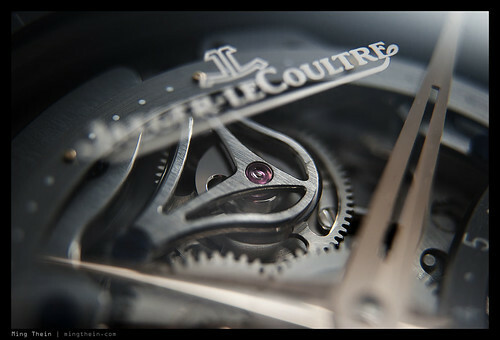 I think JLC made the right decision to not put a dial on this piece; the dial side of the movement holds the striking train and upper pivot jewels for many components, notably the entire repeater train. Watching the works in action is definitely one of the highlights of this piece. 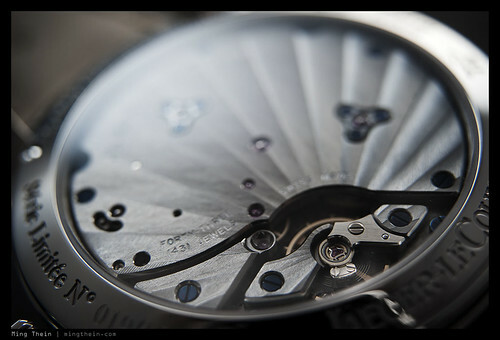 It also saves the owner from having to wear it upside down – this must be one of the few watches where the dial side of the movement is definitely more beautiful than the top plate. Not much to say about the repeater slide, other than the action is quite long and firm; you don’t want to be accidentally half-activating the strike mechanism and risking a very hefty repair bill. I’d like to see a bit less vertical play in the slide; though I understand why some tolerances may be required for smooth operating. 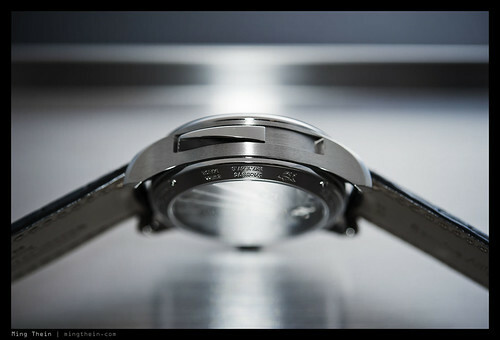 Despite the long slide, the watch still carries a 50m water resistance rating – though you’d be nuts to swim with it. 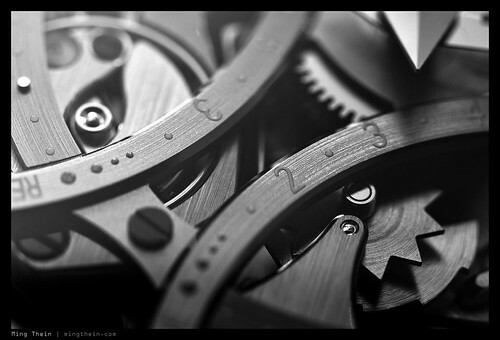 I leave you with one final image of the watch – it’s really a very warm, cinematic piece despite the rose gold indices; I think that blued steel hands and indices would contrast with the dial better, but people who know me will also know of my strong personal bias in that direction.